What happens when you give a group of Girl Scouts and their friends with little or no experience, tools, and tell them to help build a house for a week? You get a 60' x 5’ sidewalk trench, a full room of sheet rock and hundreds of square feet of newly hung siding. 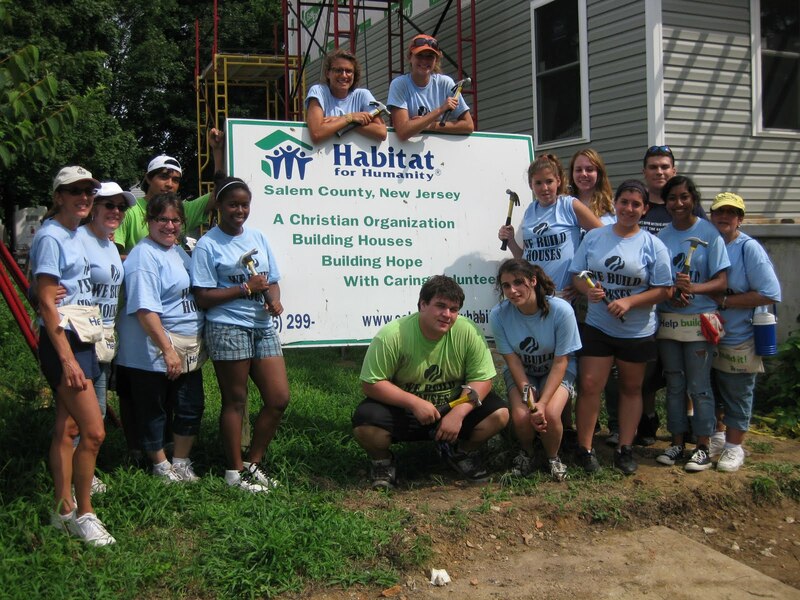 Well, at least that is what happened when Valley Stream Girl Scout Troop 2053, led by Lorraine Pergola and JoAnn Scala, spent the week working for Habitat for Humanity in Salem, New Jersey. After years together as a troop, the girls decided that they wanted to do something meaningful before they went their separate ways and with everyone entering either college or senior year of high school, this would be the last chance to do something together as a group. They decided that with the money they had raised from years of cookie sales that they wanted to do something that would introduce them to a new experience while helping those in need at the same time. Habitat for Humanity was the obvious choice as it offered a great life experience as well as important lessons in home improvement, and gave the girls the opportunity to see their work materialize in the form of a house for a single mother of two young children. As Jaclyn Stamile, a Senior at South High School, put it, "even though many of us were beginners in the construction business, seeing part of a home completed for another person is fascinating". The group of fifteen, consisting of both girls and boys along with their adult chaperones, applied for the project through Habitat for Humanity's Collegiate Challenge. The Collegiate Challenge is a week-long program specifically for those sixteen years of age and older with the goals of skill building, eliminating poverty and getting the volunteers connected to the surrounding area. With many locations around the country available, the group decided on New Jersey because of the opportunity to help people close to home and to avoid the burden of the extended travel as would have been necessary for many of other locations. Once settled in the church which they would call home for the week, the group traveled to the work site and divided into three crews based on skill and interest. Those comfortable with heights tackled the scaffolding, those willing to do some heavy lifting took on the sidewalk and the remaining volunteers moved indoors to work on measuring and hanging sheet rock. After lessons from the site managers, they got to work, facing both the hot July temperatures and summer thunderstorms during their week. Yet, everyone quickly began to master their own part of the job and the tasks that were at first daunting, became routine. "Working as a team for Habitat for Humanity didn't feel like work at all," said Will Hunter, a Senior at North High School. " To be involved in the process of giving someone a home was extremely rewarding." Even as skills developed, physical and mental limitations were challenged throughout the week . As the days went on, the scaffold grew from two stories to three and the ladders had to go up to match. As work on the sidewalk progressed, roots and old concrete slabs needed to be broken apart and pulled up when least expected, but everyone managed to work together to get around every obstacle that they were faced with. "In the beginning, I was nervous working on the lower levels of the scaffolding," said Kristen Wraith, a freshman at Harvard University. "But by the end of the week we were 25 feet up and I was fine. It just took a little getting used to. I did it because I enjoyed seeing the before and after of what we had done." One volunteer, Travis Lopez, a freshman at Rochester Institute of Technology, had worked for Habitat once before and jumped at the opportunity to do so again. He acknowledged how a group can grow to cooperate and build together when working for a common cause. "Even if you have never met the people you are sharing the experience with, after a day of work you develop a friendship and a special bond." This was the case for all of the Valley Streamers, who quickly adjusted to working with the professionals on site. They learned to take criticism and more than once, had to redo some of their work. Still, there were no hard feelings because by the end of the week, they had picked up on the technical terms of the job, were able to raise and lower scaffolds, side a house, finish a roof, level a sidewalk channel, measure and cut sheet rock, and use all of the tools necessary to get their jobs done, all in the hot, summer sun. Yet, everyone kept in mind the reason that they were working in the first place, an idea that was reinforced when Ciara and her daughter, the future homeowners, showed up on the site to thank the volunteers for their work. "As teenagers we can not easily donate money out of our pockets, however we can donate our time and will power," Hunter said of lending a hand. "I am thoroughly grateful to have been a part of that experience and would strongly consider helping out again. When Ciara came to the site, it put a name and face to the work, and seeing how fascinated her daughter was with all that was being done was an added incentive to keep going." This feeling was mutual for all involved. The best possible encouragement for these teens, according to Christine Schaefer, a freshman at St. Josephs NY, was working from the heart to give others a home. After seeing the family that will be getting the house, the group said that they felt more of a connection to what they were doing. The joy of helping others was what helped the teens power through the week without a hitch. This joy was best summed up by Travis Lopez, who commented, "By working with Habitat for Humanity, I was able to play a small role in the massive change of the homeowner's life. By changing the life of another, you change a bit yourself, which to me is the true reward". Being a girl has been a different row to hoe for females across the years, and across cultures and continents. In many ways today girls in twenty-first century USA have reached parity with males and even moved ahead in a few areas. But the pressure to succeed, to meet the expectations set for girls by their parents, their schools, their peers and the relentless onslaught of the media to look and act and consume in certain proscribed ways has never been as rough for girls as it is today. When girls lack confidence and courage they are more at risk for their physical, social and emotional health. The obesity crisis rises up against the pandering of the media for girls to grow up too quickly, to buy things that they do not need, to conform to images of beauty that may be totally unreal and unattainable. When girls do not feel confident and safe, they are more likely to miss school, and engage in behaviors that put themselves and their communities at risk. Girl Scouts are addressing these issues and more, every day. We work with girls at the Troop level and individually to find a safe space where they can discover more about themselves and the world around them, connect with other people and ideas, and where they can take action to make the world a better place. Cookies, crafts and camping are all terrific ways for girls to build skills, appreciate the environment and learn to make their own way, but those activities are just a small part of the programming and values that Girl Scouts provide. Robots, science, music, travel, adventure, problem solving and tackling community problems such as land use and hunger are all in the Girl Scout’s Journey. And Girl Scouts are taking action -- locally and across the country. Girl Scouts of Nassau County’s Critical Issues initiative has been working on the problem of relational aggression, social bullying and cyber-bullying for the past five years. This year, with the help of the New York State Girl Scout Legislative Network, the NYS Dignity for All Students Act was passed in Albany. US Representative Carolyn McCarthy is working on the issue of bullying and a Suffolk Girl Scout recently testified before Congress on how Girl Scouting had helped her to address bullying in her life. We are supporting HR 4925, the Healthy Media Images for Youth Act , so that girls see true and reasonable portrayals of healthy people in the ads that come at them each day. Girl Scout Teamwork is Stronger than a Storm! It was a dark and stormy night on Wednesday evening, July 21, the last night of Camp Blue Bay’s Session #2. An alleged water spout traveled through Gardiners Bay on the East End of Long Island, wrecking havoc on the Springs section of East Hampton, and hitting our property. Rains poured and winds blew. Trees fell over. When the storm passed after less than a half hour, the Camp was dark. Very dark. First, as the storm began, our staff acted quickly to move all the girls inside the Activity Building for their safety. All of the girls and staff remained safe throughout the night. The storm took out power and phone service. A few staff were able to use their cell phones, but then the power outage rendered the cell phone towers out of service. The Counselors kept th e girls singing for hours and hours, until they fell asleep on the floor. Some girls were a little shaken, but everyone of them was safe and well, and they have the stories to tell for many years to come! Once we learned of the problem here in Nassau County, we posted word on our webpage and Facebook page that all the girls were safe, but with no electricity, we would not be able to send girls out for Session #3 the next morning. Until the sun came up, we would not know how bad the damage was, and with no electricity we could not run our water system. We knew that at a minimum we would need to delay camp by one day, and possibly more. The next morning our Camp Staff jumped into action. Camp Director Catherine Mottola and our Rangers assessed the damage, while the counselors worked quickly to get all the girls ready to return home. The buses could not get in until the town roads were cleared. While most girls were expected by their parents that day, girls scheduled for multiple sessions also had to come home. Office staff back in Garden City got to work calling all the parents for the session that was being completed, and the one scheduled to go out that morning. It was hard to deliver news that was so disappointing since some girls wait all year to go to Camp Blue Bay! By Thursday afternoon, we recognized that we would not be able to open Camp Blue Bay for Session #3. More calls were made to families, more postings to the internet to keep everyone informed. By 7:00 p.m. more than 100 families had received the news. We promised to work to try and reopen for Session #4 on July 29. The next step was to get to work on repairs; so much to be done and only one week. The tasks were monumental and everyone at Blue Bay had an assignment. First was to clean up the debris and personal belongings that had been strewn throughout the camp by the storm. Simultaneously, they had to identify and prioritize the most hazardous sections of the Camp. Call the tree surgeons. Work with LIPA to determine when the electricity would be restored and once the power was restored, bringing the wells back up and running was a big job. There were dozens and dozens of trees down. A few were on wires and structures, so they were the first that had to go. Then the ones that were in danger of falling on paths where girls needed to be. Catherine and her team identified the trees. The professionals got them down on the ground – many required the use of cherry pickers. Our Ranger staff then sawed the fallen trees into to moveable pieces, and our Counselors moved brush into piles and stacked wood. It was amazing organization and teamwork. And they did much of this work in 90+ degree heat and high humidity. This was certainly not the job our Counselors had signed on to do, but they did it willingly and with great, good humor. Because of the leadership of Laura Bissett-Carr, Manager of Program and Outdoor Services, who spent that weekend with her husband working on the ground at Camp, the dedication and focus of Catherine in mobilizing her team, the sheer hard work of Rangers Jon Paul and Jim, and a great crew of professional tree surgeons, Camp Blue was able to reopen for Session #4. I was on the bus with those campers who arrived on July 29 to the Camp, and I don’t know who was happier, the girls or the Counselors that were awaiting them!. The improvements to what I witnessed between the Friday after the storm to July 29 were staggering. The Camp was not perfect, but it was safe and ready to go. And for that we can thank God, for leading our girls through the storm safely, and for providing the leadership of Laura and Catherine and the hard work and determination of all who worked through the heat to get Camp Blue Bay ready again for the GIRLS! There is still work to be done and we will continue to work to restore the Camp throughout the fall and into next Spring. Some areas will be noticeably different with the trees cleared away, but it is the way of the forest to restore itself in its time. Meanwhile, we are so happy to be open for business for the GIRLS who make Camp Blue Bay a place of learning, leadership and laughter.